I have long argued that third party logistics providers (3PLs) should set themselves apart from the competition by fully harnessing the power and value of their customer and employee communities (see “If Operational Excellence is a Given, Then What Else Matters for 3PLs?” and “Operational Excellence is Not Enough–Why 3PLs Must Leverage Their Most Valuable Asset”). Take user/customer conferences as an example. While software vendors have been organizing user conferences for many years, the concept of bringing customers and employees together to engage in peer-to-peer learning and networking is still relatively new for most 3PLs. But the tide is starting to change, as more 3PLs are either launching or expanding their customer engagement efforts this year. A couple of weeks ago, for example, I had the opportunity to speak at a forum organized by C.H. Robinson in Chicago (C.H. Robinson is a Logistics Viewpoints sponsor). The event was held at Loyola University of Chicago in an MBA-like classroom with stadium seating. The “look and feel” of the room aligned nicely with the event’s goal: to provide C.H. Robinson’s employees and customers (more than 100 attendees in total) with an educational experience. To facilitate peer-to-peer learning, the program was structured to encourage audience participation. 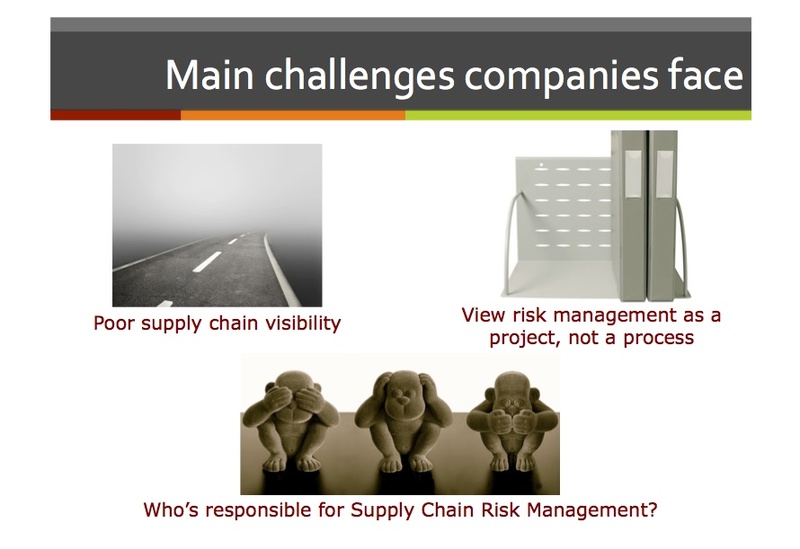 I kicked things off with a discussion on supply chain risk management, leveraging some of my research and writings on this topic (see “Many Companies Falling Short on Supply Chain Risk Management” and “Rethinking Supply Chain Risk Management”). I approached the session like an Executive MBA class, engaging the audience throughout for their ideas and questions — and they did not disappoint! In fact, the audience stole my thunder a few times by raising points I had planned to discuss later in my presentation. The highlight of the forum was the customer panel session. For confidentiality reasons, I won’t name the customers, but they represented a variety of industries and company sizes, and they work with C.H. Robinson in different ways. The conversation focused on four key topics: spend management, efficiency improvement, risk management, and change management. Without going into specifics, it was enlightening (not just for me, but for everyone in the room) to hear directly from customers about their views, strategies, priorities, and objectives related to these topics — and to note the common threads between them, and where their views and experiences differed and why. Simply put, the 90-minute discussion, driven by questions from the moderator and audience, was a great example of peer-to-peer learning in action. The forum concluded with a “fireside chat” between me and Chris O’Brien, Senior Vice President at C.H. Robinson, where we discussed several important factors necessary to calculate total landed cost and how companies can leverage TLC to derive supply chain benefits. Chris and I discussed this same topic in more detail in a recent episode of Talking Logistics (watch the short clip below where Chris talks about the importance of SKU-level data in determining total landed costs, and what insights companies can gain from having high-quality SKU-level data). We also discussed how near-shoring, omni-channel distribution, and natural gas vehicles are beginning to play an influential role in today’s supply chains, and what their impacts may be on future strategies. 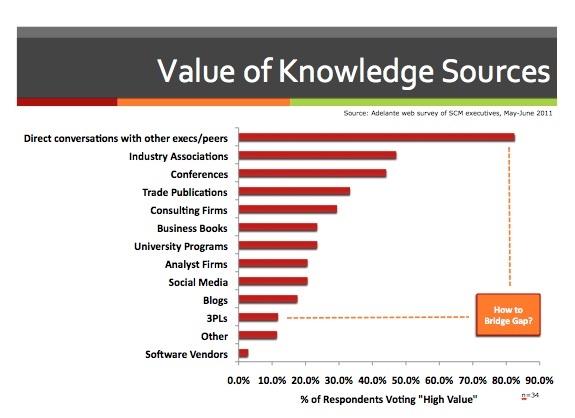 The bottom line: as a survey I conducted a couple of years ago revealed, supply chain and logistics professionals view peer-to-peer learning and networking as the most valuable source of practical knowledge and advice. Yet most 3PLs, despite having large and diverse sets of clients and employees, do a poor job of bringing these communities together to facilitate knowledge exchange and networking. The irony is that many 3PLs are working so hard these days to grow their social media communities (an effort I completely support and encourage), yet they continue to drop the ball when it comes to engaging their existing “real world” communities. As the attendees of C.H. Robinson’s forum would attest, spending an afternoon (or a day or two) with your peers and other industry professionals, sharing ideas, knowledge, and advice, is infinitely more valuable than picking up another follower on Twitter or Facebook, especially for the people who matter the most — your customers.